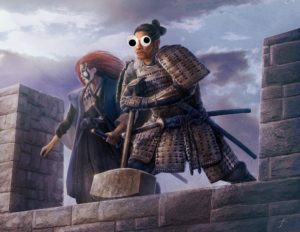 Below is a consolidation of the questions L5R Designers Brad Andres and Tyler Parrott answered on Reddit with links to the original reddit posts. You can see all of the original posts and followup comments from the community at the full Reddit page here. 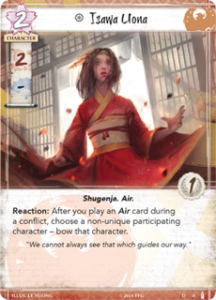 Q1: Excluding the most one-sided matches, victory in L5R is usually achieved by giving up victory conditions (such as province breaks and honor) in order to preserve resources neccessary for the final push. Because of that, the tiebreaker system has a tendency of favouring the player that is actually losing the game. It also encourages playstyles that try to win by stalling out the game instead of actually trying to win. Are there any plans to change the tiebreakers to be more representative? Q2: A handful of provinces (Feast or Famine, Shameful Display and Restoration of Balance*) have proven to be drastically above the curve due to the tremendous board position swings they create and limited to non-existent counterplay available. Do you plan to deal with that power disparity directly or by increasing the amount and availability of province hate? Q3: The data collected by the playerbase shows a serious advantage for the second player (every single clan in the game wins more games when going second on the first round, with some having a difference reaching allmost 15%). Have you considered any changes to the benefits and drawbacks of the first player token? *an honourable mention goes to Kuroi Mori, which I excluded from my question as it’s power comes from being virtually impossible to break (especially under stronghold) for most unicorn, lion and crab decks rather than creating a dominant board position for the user. We’re always looking to improve the tournament experience in any way we can. Our goal is to always be making it better and pushing forward. 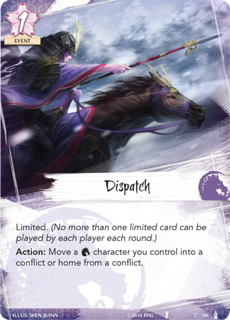 Provinces are a unique part of L5R, and we want province choice to be interesting for players in deckbuilding. We are continuing to steer toward the sweet spot for exciting but not overwhelming provinces. Looking to the future, we’re also trying to find new directions to take the game that will make more provinces viable. It’s something we’re watching. Stay tuned! How do you guys feel about the Dueling Mechanic? Is it working the way you envisioned? Can we expect to see cards with effects similar to Focus Effects from the old game? A: B&T: We intentionally left room for the Dueling Mechanic to grow, so expect to see more dynamic duels in the future. There are lots of critics (including myself) regarding the “limit 1 per deck” with really really strong cards like Kanjo and Karada district. What was your intention with those cards and what do you think of it now ? A: B&T: The limit one per deck initially came about as a solution to unique holdings. That said, a card game is enjoyable when individual games are different from each other. So sometimes we want to design cards that increase variance in gameplay, and this is a tool to do that. Was the decision to have roles locked made by design or by Organized play? How has this deck building restriction effected how design creates role locked cards? A: B: The decision was made by design. It was one of the earliest things we talked about when we started concepting the game, actually, as one of our ‘pillars of player interaction.’ We wanted a mechanical mirror of the storyline decisions that were present in the original game, that a tournament-focused player could get excited about. T: Designing role-locked cards is an exciting challenge, because you want it to be something that is powerful enough that people want it, but not so powerful that the roles that unlock it invalidate all of the other roles. I’m looking forward to seeing the community debate about which roles the clans want, as more role-locked cards come out and the role choices matter more in the deckbuilding process. Hello, I’ve been enjoying the game immensely, and found myself constantly playing games with my favourite clan, despite its current weakness. Anyways, if you cannot guess my favourite clan is Unicorn, and my question is. If you could change one thing about Unicorn within the current meta, what would you change, and how would you accomplish this? A: B&T: The Elemental Cycle was our first chance to respond to the environment that was put forth by the core set, and so we made sure to address some of Unicorn’s weaknesses and bring them to parity with the other clans. We can’t wait for this cycle to come out and for the Unicorn to return in full force! A: T: Neutral cards are hard to balance, haha. B: The game is a complicated beast, and getting it into the hands of players has shown where it needs to be more robust. I’d say the biggest lesson is being flexible, watching where the game wants to go, and guiding it forward without putting roadblocks in front of it. T: Also, ensuring that as the game progresses, it doesn’t become overly complicated, because it’s an easy thing to do by accident. We want to keep the game dynamic and interesting, but still approachable. Hey question when you guys get around d to it! In Old5r player decisions were a large factor in the narrative and card design. It seemed there was some of that to start at worlds, but since then that whole process has felt more or less forgotten. Has there been a thought change on the matter? Are there more plans coming? Thank you for your time and great game ! A: B&T: The decisions made by the players so far have had enormous impacts on the game that have not come to light yet. We’re extremely excited to show what your decisions hath wrought! When first designing the game with Nate French, how often did you believe that players would achieve victory by honor? Do you plan to offer more support for the win condition while retaining a level of interactivity? A: B: We intentionally made it the weakest of the three out of the core set, because that is the win condition with the biggest potential to become non-interactive. Rather than taking a guess and being wrong, we decided to slowly ramp up the honor victory condition to find that sweet spot where it’s fun and interactive. A: T: Making them feel distinct, and encouraging players to use them with other members of the same minor clan. B: In the Elemental Cycle, when I started tackling design for the Mantis cards, a strategy that I took was trying to find design space between the other clans, carving out a niche of their own. I wanted them to have a distinct feel to reflect their unique place in Rokugani society. The place I eventually landed on was trying to translate their propensity for trade into mechanical effects, which mainly focus on exchanging one type of in-game resource for another. How will the fiction and Koteis results affect the design of future cards? A: B&T: We design the sets in conjunction with the fiction, so that the story and the game can progress together. That said, the Kotei results do not impact the design of cards, except in specific storyline choices. With the story progressing we are already seeing characters grow and develop. Are there plans to release new variations of names characters, representing their changes over time. Example being Akodo Toturi, now as Emerald Champion, could we one day see him printed in a new card, showcasing this new role he plays in Rokugan? A: B&T: Yes! It would be silly of us to squander such a thrilling mechanical and thematic opportunity. What do you view as your proudest achievement since the game’s release? A: B: My proudest achievement is designing a multiplayer format for the game that I’m happy with. I agonized over it for over a year, trying to figure out an implementation that would bring something new to the game without detracting from what the game is about, or rewriting it entirely. I’m eagerly anticipating fan feedback from the beta. I can’t wait to hear what you all think! Brad and Tyler on the Wall. 1) Are there any cards you are particularly proud of, with how fun and/or thematically appropriate it is? 2) Were you surprised by the reaction of player base to any particular card? 3) Are there any published cards that were really contravesial internally? B: You really have no idea how people are going to react to any particular card. T: The Scorpion Clan’s stronghold stands out to me, because it reads so innocuously but is so powerful, and that wasn’t immediately clear to us or the player base until many months after release. B&T: Working as a team, there are always conflicting ideas about what might work best, but ultimately when you compromise you end up with a design that’s more balanced. What does the process of assembling a restricted list look like? A: Brad: The biggest part is ensuring the Restricted List has a positive effect on the metagame. Making sure there are hard choices being presented to players, and therefore restricting cards from not only the neutral pool but multiple cards from each top deck. Tyler: Part of it is making sure that each card on the list is equivalent to each other … we don’t want card A to be so obviously better than card B that people only ever choose card A. That said, there are ubiquitous cards [Policy Debate, Charge] that we didn’t want everyone to be playing all the time. B&T: When assembling a list like this, we always put it out to our playtesters. We want to make sure that those choices are present and viable in competitive play, and the only way to do that is through extensive playtesting. Because we want to have an idea of what the game will look like after the list is released, so we can catch anything else that might come up. Conquest fan here now heavily involved in L5R. How are you perceiving the effectiveness and fun of the restricted roles? I know this is something that players are split on. Do you have any plans on changing how restricted roles work or thoughts on how the current rules have contributed to the game’s success and competitive level (over having no restricted role)? A: T: We’re always looking to improve the ways roles work in the game and the metagame. The discussions from last year’s Worlds regarding the Scorpion Clan’s role were exciting and exactly what we were looking for out of the process. That said, as more role-restricted cards come out throughout the year, we hope to see more engagement in the process more frequently. Hi, long time lurker, first time poster. Big fan of your work. In a recent article, a partial image of an intriguing new card – Isawa Uona – was revealed. Any chance you would be able to provide a full reveal of her card, or let us know what her ability is?